Ugo De Rosa, one of the most successful frame builders was born on January 27, 1934 in Milan, Italy. His passion led him to study mechanics and engineering at a technical college. Later in the early 1950s he opened his first shop and commenced the manufacture of racing bicycles. 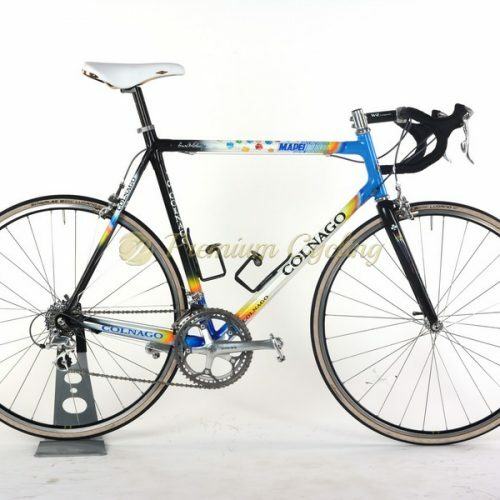 He supplied many champions with his high-end bicycles (Gianni Motta, Eddy Merckx and Francesco Moser…), and also strongly influenced the cycling industry with his amazing bikes from Cusano Milanino, Italy. Hard to find words about this beautiful De Rosa. The Giro d´Italia model was one of the top racing bicycle frames built in the very early 1990s. Very quality frame is made of Columbus Nivacrom EL tubes, (which are very light and stiff thanks to increased diameters) and is bulit with superb Campagnolo C record 2nd generation groupset and Cinelli parts (stem, handlebar and 45th Anniversarry saddle). The paintwork shines in very nice Ferrari red colour. Very nice catch for all DeRosa enthusiasts. Condition: Used. The bike is in very good condition. The frame has no dents, no cracks, is not bent and has no touchups. Chrome at the chainstay shows some micro blemishes. Some signs of normal use. All parts are working fine.